Lateral heterogeneity of cholesterol distribution in cell plasma membrane was revealed by a complex study using microfluorimetry, immunofluorescence microscopy, and time-of-flight secondary ion mass spectrometry (TOF-SIMS). Glioblastoma cells U87MG exhibit a high motility, and cell movements are accompanied by redistribution of proteins along the membrane surface. The formation of the protein caveolin-1 clusters at one of the plasma membrane edges was detected by confocal microscopy on cells labeled with antibodies against caveolin 1. Using two-photon excitation fluorescence of a membrane probe 4-dimethylaminochalcone, membrane areas of about 200 × 200 nm were examined on glioblastoma cells. 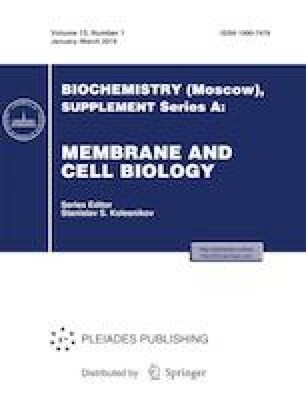 Simultaneous detection of the decay kinetics and the fluorescence spectrum revealed the presence of regions with an increased cholesterol concentration in the membrane at the poles of the live migrating cell. TOF-SIMS provided direct data with high spatial resolution indicating colocalization of cholesterol and caveolin 1 and confirmed previously published data on the association of caveolin 1 complexes with cholesterol clusters. Thus, three independent methods of cell membrane analysis testify that localization of cholesterol-enriched membrane regions correlates with morphological features of moving glioblastoma cells. The work was supported by the Russian Foundation for Basic Research (project nos. 16-04-00660, 17-29-06056, and 18-29-01027). Part of the TOF-SIMS measurements was performed at the expense of the subsidy issued to the IBCh RAS in support of the State task, theme 0082-2018-0005 (code AAAA-A18-118020690203-8), with the use of the instruments of the Center of the Collective Equipment ICP RAS (no. 506 694).